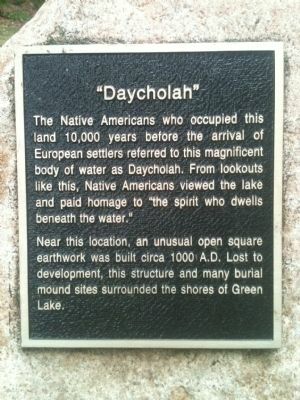 The Native Americans who occupied this land 10,000 years before the arrival of European settlers referred to this magnificent body of water as Daycholah. 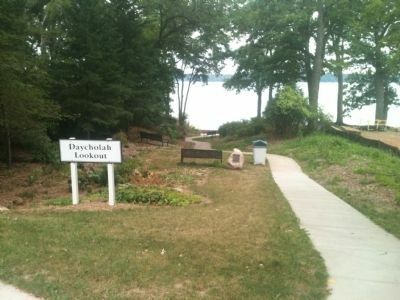 From lookouts like this, Native Americans viewed the lake and paid homage to "the spirit who dwells beneath the water." Near this location, an unusual open square earthwork was built circa 1000 A.D. Lost to development, this structure and many burial mound sites surrounded the shores of Green Lake. Location. 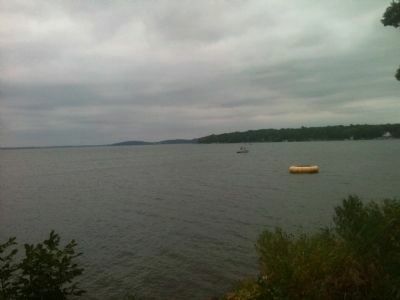 43° 50.21′ N, 88° 57.52′ W. Marker is in Green Lake, Wisconsin, in Green Lake County. Marker can be reached from the intersection of Lake Street and Illinois Avenue, on the right when traveling south. Touch for map. Marker is in this post office area: Green Lake WI 54941, United States of America. Touch for directions. Other nearby markers. At least 8 other markers are within 6 miles of this marker, measured as the crow flies. In Memory (approx. 0.6 miles away); Dartford–Green Lake Dam (approx. 0.7 miles away); "No Hurry" (approx. 3 miles away); Chapel Car "Grace" (approx. 3.1 miles away); Ceresco (approx. The marker is located at Daycholah Lookout, next to the bench. 5.4 miles away); Carrie Chapman Catt (approx. 5½ miles away); First Congregational Church of Ripon (approx. 5.9 miles away); Ripon College (approx. 5.9 miles away). Touch for a list and map of all markers in Green Lake. This is the view of Green Lake looking southwest. The bluff on the left is Sugar Loaf. To the right of that is Lone Tree Point, home of the Green Lake Conference Center (also known as the American Baptist Assembly). More. Search the internet for "Daycholah". Credits. This page was last revised on June 16, 2016. This page originally submitted on October 15, 2013, by William J. Toman of Green Lake, Wisconsin. This page has been viewed 383 times since then and 9 times this year. Photos: 1, 2, 3. submitted on October 15, 2013, by William J. Toman of Green Lake, Wisconsin.